Light refreshements will be served. There is plenty of free parking and the building is wheelchair accessible. 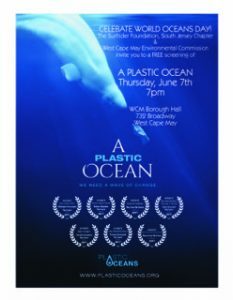 Following the screening of the film, the Surfrider Foundation, South Jersey Chapter will present a panel discussion about the importance of rethinking our use of plastic, especially single use plastic. A Plastic Ocean is a documentary directed by Craig Leeson, an Australian journalist. Lesson and Tanya Streeter, an environmental activist and a world record-breaking free diver, investigate the amount of plastic pollution in our oceans and the impact on our sea life around the world. The movie is rate PG and is suitable for adults and teenagers.